New Delhi: The allegations of expansive corruption among those associated with the Commonwealth Games stormed through Parliament on Monday. Seeking cooperation from all quarters for making the Commonwealth Games a success, Urban Development Minister S Jaipal Reddy today said a total of R 28,054 crore have been spent on the games out of which R 16,560 crore was given to the Delhi Government for upgrading the capital infrastructure and building of various stadia. Making an intervention during a debate in the Lok Sabha on the Commonwealth Games, Reddy said of the total of money given to the Delhi Government, only R 670 crore has been spent directly on the games -- on building stadia. "The rest of the money has been spent on infrastructure development of the capital, which is not directly linked to the games," he said. Giving a break-up of the money spent, the minister said, the Delhi Government has spent on various projects which includes R 650 crore for street scaping, R 900 crore for development bus depots, R 3,000 crore for extension of Metro, R18,000 crore for augmenting DTC bus services and R 3,700 crore on flyovers and bridges." "Of the R 11,494 crore spent by the centre, R 2.934 crore was spent on sports infrastructure and R 678 crore on training of teams, while R 182 crore has been given to MTNL, R 827.85 crore to the Ministry of Urban Development, R 487.57 to Information and Broadcasting Ministry and R 747 crore to Health Ministry. Reddy said the government has also given R 2,394 crore as loan to the organising committee, which is to be returned by them after the games. Defending the huge amount of money spent, he said most of the money has been spent of infrastructure development which will remain as the country's legacy long after the games are over. "If you furnish and paint your house before your daughter's wedding, then the money spent on that cannot be said to be part of the dowry," he said. Earlier the Lok Sabha, the BJP demanded an extensive investigation and reiterated its demand for a joint parliamentary committee to study the financial irregularities. Initiating the debate, the BJP's Kirti Azad provided some lively analogies during the angry debate. He compared the Games to a big fat Indian wedding where the groom is missing. He also said, "I enjoyed James Bond films when I was young. He's a MI-6 spy with the license to kill. I want to know, who asked the Central Vigilance Commission for the license to corruption? There is no agency that has escaped allegations of corruption." The former Indian cricketer and BJP MP from Darbhanga, quipped, "What is the status of the stadia? Will we be able to save our pride?" Manish Tewari, the Congress spokesperson and MP from Ludhiana, passed the buck back to the BJP, insisting that the key decisions surrounding the Games were taken when the BJP-led NDA coalition was in power." 18 of 20 stadia where the games would be held have been completed and handed over to the organising committee. One stadium will be completed by August 14, and Siri Fort will be completed by September 16," said Tewari. 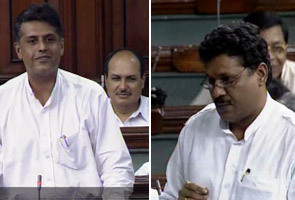 On allegations of corruption, Tewari said, "If someone is to blame, please hang him. But do not cut your nose to spite your face. There are just 49 days left for the Commonwealth Games." This standoff in Parliament came amidst fresh media reports on Suresh Kalmadi have provided more fodder for a united opposition attack on the government. A report in the newspaper Times of India claims that after his earlier denial, there is evidence now to prove that CWG Organising Committee chief Suresh Kalmadi himself cleared payments to UK-based firm AM Films. The newspaper report alleges that more emails and faxed documents unearthed point towards the involvement of Kalmadi, suggesting that he was aware of all payments made to the UK-based firm AM films and its sister concern AM Car and Van Hire, run by businessman Ashish Patel . The Organising Committee general secretary Lalit Bhanot met Suresh Kalmadi at his residence in Delhi today. Meanwhile, acting on the persistent plea of the Sports Ministry, the Commonwealth Games Organising Committee today terminated the services of its tainted Joint Director General T S Darbari . Darbari, who had been suspended pending an inquiry after his name cropped up in alleged corruption during the Queen's Baton Relay's launch in London, has been told to hand over charge to Additional Director General V K Saxena. Darbari appeared before the Enforcement Directorate in connection with its probe into alleged financial irregularities relating to the Queen's Baton Relay in London. Official sources said Darbari, a close aide of OC chairman Suresh Kalmadi, has been asked to explain certain financial transactions undertaken during the QBR last year. Darbari had been asked to bring all documents related to money transactions and grant of contracts to different agencies in London.